Mr. Acquadro in his first solo show at Studio Gallery draws his inspiration from Master Paintings and abstracts each work, including Fragonard, Vermeer and Turner as his inspiration.His abstract works reference the Master but create a unique and rich palette from Mr Acquadro's own imagination. Harris describes her creative process as a meditation. Her work explores the visual nature of energy, and the ways it moves through different materials and different objects. "The reaching limbs of a tree, the unfurling petals of a flower, the gestures of a model - all are expressions of the flow of energy," she explains. Mountains have been a traditional subject for Chinese landscape paintings since the eleventh century. These mountains have always been my love and painting these bones of the earth has provided with a joy and endless fascination both with the paintings themselves and with the connection with my heritage that they provide. 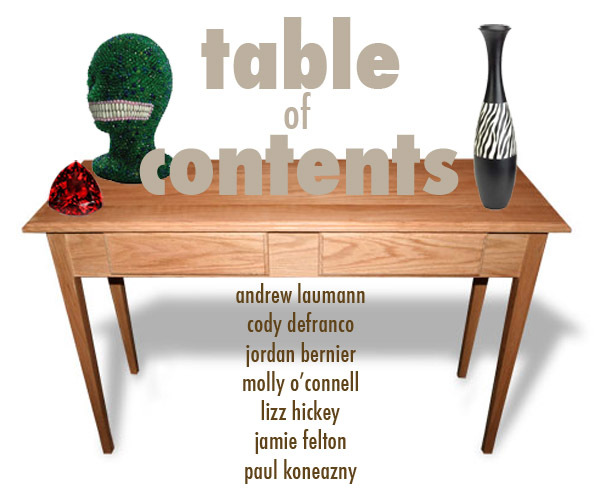 First Friday - April - Will be Friday, April 2nd, 6 - 9 pm at Hillyer Art Space (9 Hillyer Ct., NW, Washington, DC 20008). It is open to the public and ALL are encouraged to come! A special preview reception and performance by "Professor Benjamin J. Dreadnought, PhD." in conjunction with International Arts & Artists' Hillyer Art Space's upcoming exhibition by Clarke Bedford! From the Family of Man to All in the Family: Appropriation and Desecration in Ancestor Worship of the Post-War Period. CRIT '10 - April - Will be Wednesday, April 14th, 6:30 - 8:30 pm at Hillyer Art Space (9 Hillyer Ct., NW, Washington, DC 20008). It is open to the public and ALL encouraged to come! (CALL FOR PARTICIPANTS)!!! This event is a scheduled open critique for ALL artists. Each critique will be open to 8-12 artists on a first come, first serve basis. Please be advised: the critiques fill up QUICKLY. 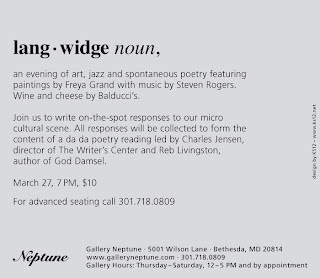 If you are interested in participating, please contact Lachelle Slade at membership@artsandartists.org or 202-338-0680. Visual artists from the mid-Atlantic region are invited to submit images of their work for the 4th annual juried MPAartfest to be held on Sunday October 3, 2010. The submission deadline is June 1, 2010. This one-day juried fine art and craft show and sale will feature the work of 40 local and regional visual artists. Held in McLean Central Park, last year’s event drew 6,000 art and music devotees. For the submission guidelines and form, go to www.mpaart.org/artfest.php or stop by McLean Project for the Arts. James Cassell’s past work was highly personal in nature, turning the lens on the inner workings of his extended family. For this exhibition, he has broadened his scope to look at the natural world around him and current events (The News is Disquieting). With these influences, Cassell pulls things apart and reassembles them in a way that makes sense to him. Rather than editorialize, Cassell allows the viewer to bring their own experiences into question. Peter E. Harper’s earlier figurative work has expanded to include abstraction that is bold, messy and expressive—a reflection of the inner mind. Rough hewn lines empty into pools of flat grey (What lightning do). Structure and form are bisected by scraped paths of color. All of this to say that life has its moments of quiet and solitude, of excitement and passion, and of violence and anger. Harper wrestles to find this balance and encourages you to do so also. Joren A. Lindholm takes a thoughtful approach to his work, often creating multiple studies of a piece before completion. His collage work on view has sometimes spawned paintings with a similar content. Once in painting, Lindholm makes intuitive choices about color and shape, abstracting the more literal work of the collage and placing signs for the viewer to discover and discern for himself (The Traveler and the Travel). Zade Ramsey has found the perfect medium to depict family histories that haunt and shape our psyches. Using materials like antique objects, family photos, and vintage fabrics, Ramsey creates what he calls Memory Boxes. With each, he encourages the viewer to remember events and emotions of the past and reconnect to family long gone and stories left behind. Each piece is a bit mischievous and allows the viewer to create their own narrative derived from the content of the fanciful boxes (Last American Girl). In this first of three exhibitions planned for 2010, Thomas Drymon selects work that is fresh and contemporary. The artists chosen for exhibition share qualities both personal and professional, including a willingness to question themselves and the world around them; to explore honest means of communication to an audience; and to grow and progress in their work and personal lives. Their take on the world is defined by real life experiences. And while there is a bit of the theoretical in the works, most can be defined by bold and brave use of the media of choice. These low- to mid-priced works are designed to introduce art collecting to a broader audience and will be shown at traditional and nontraditional venues. For more information, contact Thomas Drymon. Timothy D. Albrecht Principal of “Patricia Secco” has been a curator for Patricia Secco for several of her exhibitions in the D.C Metropolitan Area. Please visit www.Herend-MoserBoutique.us for more details & upcoming events. WPArade: The WPA Art Parade is an extravaganza of artists connecting with community to create a moving visual spectacle of art and culture. Visual artists, performers, architects, musicians, and visual arts organizations are invited to work independently, together, and in partnership with community organizations to create inflatable art, placards, portable sculpture, and street performance. Participants can traverse the route in any manner that is non-motorized (wagons, bicycles, walking, etc. are acceptable). The WPArade will culminate in a post-parade celebration until 3:00 pm (open to all participants and attendees) at The Bullpen on Half Street, SE. All participants must submit an entry form. More Information and click here to download the full call for artists and entry form. WPArade is supported by the DC Commission on the Arts & Humanities, The Capitol Riverfront BID, and The Bullpen. 6 to 8 p.m. "Meet-and-Greet with the Artists"
EXPO Study Abroad and the DC Arts and Humanities Education Collaborative are pleased to announce the Global "Art Buzz" Bazaar taking place at the EXPO Study Abroad this April. This free one-day art show features the work of 15 international artists who now call Washington, D.C. home. The art show will take place during the EXPO Study Abroad on April 8th from 3 to 8 p.m. at the Washington Center of the University of California. EXPO Study Abroad is a free fair where students and young professionals can learn about various study abroad options and have the opportunity to explore reputable study, work and volunteer abroad programs located in more than 30 different countries. The fair will also feature fifteen recognized DC-based artists who hail from across the globe. Each artist will show their work during the EXPO Study Abroad at the Global "Art Buzz" Bazaar and the art will be for sale for one-day only. The EXPO Study Abroad and "Meet-and-Greet” with the Global Art Buzz Bazaar Artists are free events. Individuals may register for the EXPO at http://www.expo-studyabroad.com/en/expousa/. A special “Meet and Greet” with the artists will take place from 6 to 8 p.m. to close the show at the University of California - Washington Center. on view at Gallery Neptune in Bethesda. "Freya Grand has a secret. Near the end of the March 12 Bethesda Art Walk, a few curious fans wander into Gallery Neptune. They're here to gaze at Grand's landscapes. One asks a question about her brushes." "Do you mean how do I make the fog? Grand replies with a laugh." The paintings of Freya Grand are on display through April 3 at Gallery Neptune, 5001 Wilson Lane, Bethesda. Gallery hours are Friday and Saturday, noon to 5 p.m., and weekdays by appointment. "Langwidge" takes place at the gallery at 7 p.m. Saturday; admission is $10. 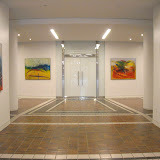 Call 301-718-0809 or visit galleryneptune.com. The Workhouse Arts Center invites all professional and amateur artists 18 years and older residing in Virginia, Maryland, DC, Pennsylvania & W. Virginia to define, defy or deny GREEN in an all media (no video please) juried exhibition that interprets the theme of green in the most creative ways. This exhibition is an attempt to provide artists with a provocative theme that will encourage creative response outside the color wheel. JUROR: Trudi Van Dyke is an independent curator and fine arts consultant who juries and curates nationally including exhibitions at the Rawls Museum Arts in Courtland, VA., The Suffolk Museum, VA., The Artisans Center of Virginia, Black Rock Center for the Arts, Germantown, MD, and the Vulcan Gallery at the Workhouse Arts Center. Ms. Van Dyke writes on the Arts for the Alexandria Times and Élan Magazine, and speaks at conferences on the “Business of Art”. Formerly director of the Torpedo Factory Arts Center Alexandria, VA and the Ellipse Art Center Arlington, VA, she travels around the country as a festival judge. $30 Entry fee for up to three images. Special preview and performance by "Professor Benjamin J. Dreadnought, PhD." in conjunction with Hillyer Art Space's upcoming exhibition by Clarke Bedford! The lecture will focus on the present vogue for mythic genealogy, specifically dissecting the disturbing obsessions of the exhibiting artist to such personages as deceased robber-baron-era collector F. D. Kalley, celebrities William Tecumseh Sherman and the Venus of Willendorf, cutting-edge conceptual/minimalist artist Coleslaw Baklava and now a perfectly innocent, anonymous and extinct American family. Professor Dreadnought will attempt to show that such substitute behavior closely resembles the procreation of certain species of jellyfish in which tissue residues develop asexually, and are more an approximation of sand shark embryonic cannibalism than they are true familial dynamics. Professor Dreadnought is a lecturer in Marine Biology at the Freedom of Information Institute and adjunct Curator of Genealogy at the Hyattsville Hills Historical society. He will be presenting his lecture in the persona of Uncle Wiggly Ward. Susan Jamison, Doe in Heat, 2010. Egg tempera on panel. 36 x 36 in. Irvine Contemporary presents Swallowtail, a solo exhibition of new paintings by Susan Jamison. This is the artist’s third solo exhibition with Irvine Contemporary. The Taubman Museum of Art, Roanoke, VA, is also presenting a solo exhibition of new and recent paintings by Susan Jamison, Into the Forest, March 5 - May 30, 2010. Working with egg tempera on panel, Susan Jamison reflects on many traditions of imagery to create dream-like portraits and figures that question gender conventions. Like dream images and memories, the paintings traverse the realms of desires, fantasies, and myths, while maintaining a playful innocence. Reflecting back on sources like fairy tales, Renaissance portraiture, botanical illustration, Persian miniatures, and Kama Sutra manuscript paintings, Jamison composes startlingly original female figures adorned with vibrant pink embroidery patterns and heads exposed with early medical illustrations. Her imagined characters, male and female, are often surrounded by symbolic and sympathetic birds, animals, butterflies, insects, and domestic objects that reference culturally familiar stories and images. The animals, plants, and objects are chosen for their symbolic meanings, and provide a new feminist context for the iconic female figures. Susan Jamison has an MFA from the Rhode Island School of Design. She has exhibited widely in Washington, New York, Richmond, VA, and international art fairs, and her works are in many prestigious private collections. Susan Jamison lives and works in Roanoke, VA.
Susana Raab, Dixie Cup Flag, 2008. C-print. 22 x 24 in. Irvine Contemporary presents Susana Raab’s first solo exhibition in Washington, DC, American Vernacular. The exhibition will feature a selection of the artist’s photographs that represent her distinctive approach to capturing the often overlooked places, people, and events in daily American life. The Smithsonian Museum of American History has recently acquired ten photographs by Susana Raab for the museum’s permanent collection. Curator Shannon Thomas Perich selected works from Raab’s Consumed and Off-Season series, from which works in the current exhibition were also selected. Susana Raab is a documentary and fine art photographer based in Washington, DC. She began her career as a photojournalist in Washington, DC, and worked for the New York Times Washington bureau for four years, where she was nominated for a Pulitzer Prize for her coverage of a shooting on Capitol Hill. She then continued her graduate studies and received her MA from the Ohio University School of Visual Communications. Her photographs have received national recognition, including awards from the White House News Photographers Association, The Ernst Haas/ Golden Light Awards, the Lucie Awards, and the Center (formerly Santa Fe Center for Photography). Her work has been published in American Photo, Photo District News, The New York Times, The Washington Post Magazine, and Photo Espana. Her work has been widely exhibited, both nationally and internationally, including the Museo de Arte Contemporaneo in Madrid, and the Noorderlicht Photofestival in the Netherlands. 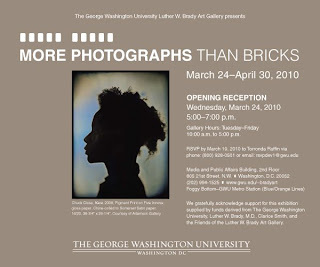 In 2009 she exhibited her work with a workshop in Shanghai, China, and received an Artist Fellowship from the Washington, DC Commission on the Arts & Humanities. The Contemporary Museum will host lectures with two distinguished figures in the world of contemporary art on back-to-back evenings as part of its New Art Dialogue Series on March 31 and April 1, 2010. The Contemporary Museum’s New Art Dialogue Series, a discourse on trends in contemporary art, will explore the relationship between art and activism with renowned artist Mel Chin on Wednesday, March 31, 2010 at 7 p.m. The lecture will be held at the Maryland Institute College of Art's (MICA) Falvey Hall. At the Walters Art Museum, Richard Vine, Managing Editor of Art in America, will examine the exponential growth of contemporary art in China and its cultural impact. This new era of Asian contemporary art will be illustrated by Vine’s firsthand accounts with installations, exhibitions, and encounters with emerging artists. He will also review movements that have shaped the rapidly-evolving contemporary art scene in post-Tiananmen China. Admission to the lectures is $10 for the general public, $5 for students, and free for members of the Contemporary Museum. The lecture with Mel Chin is also free for MICA students; the Richard Vine lecture is free for members of the Walters. Tickets will be available at the door. The Contemporary’s New Art Dialogue Series presents lectures and conversations by distinguished artists, critics, art historians, and curators whose work is defining the field of contemporary art. The series will cultivate critical discourse responsive to the cultural, social, and political issues of our time. On April 10, 2010 from 1-5pm, Gateway CDC in partnership with MNCPPC will be hosting Lenny Campello's well-known “Bootcamp for Artists” seminar at no cost to the artists. Ever wondered how to maximize the attention your work gets from the press, galleries, and museum curators? How to present your work in a professional manner and save money in the process? How to tap into grants, awards and residencies?" Video art, art installations, performance art, a Sake Haiku Bar, Marshmallow Arts, and the return of the Make Out Room! 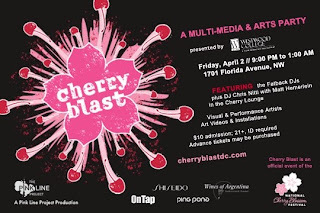 Go to CherryBlastDC.com for the complete line-up of music and art talent! ! Cherry Blast is presented by Westwood College and is an official event of the National Cherry Blossom Festival. Before my third visit to the G40 Art Summit at Crystal City yesterday evening I stopped in on the Opening Reception for the Anne Marchand's "Luminous" Exhibition at the Vornado Building at 2231 Crystal Drive in Arlington VA. Learn more about the artist Anne Marchand at her website. Luminous is part of the Crystal City BID’s ARTFUL program. This new exhibition builds on the success of previous Crystal Art projects which have demonstrated the power that art can add to public spaces. Click here to view my Anne Marchand's "Luminous" Exhibition Opening Reception - 24 March 2010 photo album. Hamiltonian Gallery announces an exhibition of new works by Hamiltonian Fellows Katherine Mann, Michael Enn Sirvet and Christian Benefiel. In moments both subtle and cacophonous, each artist reflects on often-overlooked nuances in their environments in which they live and environments created through their work. Katherine Mann's paintings take the viewer into wildly vivid landscapes that teeter between recognizable matter and abstraction. Mann initiates her paintings with pours of ink and paint and creates a colorful base of blobby stains bleeding into one another. On top sit carefully rendered shapes, outlined drips and structures that form interlocking systems. Mann elegantly overflows her paintings with ambiguous forms, which recall elements found in the sea, in the sky, and under the microscope, yet remain unidentifiable. Katherine Mann relates this poetic smash-up of incongruous pieces to her own life of heterogeneity. Shingled cherry-wood plates umbrella out into an imposing conical shape,which gracefully hangs from the gallery ceiling. Nature is the source of wonderment and inspiration for Michael Enn Sirvet's abstracted, archetypal sculptures. In his newest work, Sirvet creates structures on a scale relatable to one's own body through forms that suggest a human-sized cocoon, a gigantic seedpod, or represent the feeling of wind enveloping the body. Sirvet observes and restructures nature in his work to relay to the viewer his sense of reverence for nature. Christian Benefiel literally draws from his environment by implementing reclaimed and recycled materials and parts made from disassembled, mass-produced, low quality construction debris. By recontextualizing machine-made products, Benefiel imbues them with the essence of specialized labor and craft of building. Benefiel's assemblages physically engage the viewer to be more hands-on, which reflects his sincere nostalgia for a more authentic, handcrafted, production industry. This is the final reception for this show! 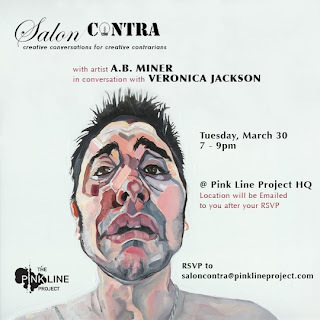 The artist will be in attendance, light refreshments provided. Artist will also be on hand for questions on Sunday, March 28, 1-5 pm. Or stop by on your way to the Baltimore Fair for Contemporary Prints, only minutes from the beltway! This is the LAST WEEK to see G-40. Don't miss out on the event that everyone is talking about. As the Washington Post wrote, this is "Art on a Grand Scale." From 6-8pm, Albus Cavus is taking participatory public art from the outside to the classroom. The Thursday class is Beat Production – Words, Beats and Life. The class is all ages, and has a $30 suggested donation. The workshops are held on the 8th floor next to the installation created by CRI, RVLTN, RAIN, JAZI, DECOY, CON, ULTRA, ROSINA, MIKA ALTSKAN and PETER K.
Georgetown at G40, with a special musical performance by See-I. Sponsored by the Georgetown University Art Aficionados. GU Art Aficionados is a community of art enthusiasts committed to expanding artistic opportunities at Georgetown and the greater DC community, and by doing so, catalyzing creative thinking among students. SEE-I has become one of the east coast's premier party bands because they know how to get people dancing all night with a smile on their face. From 6-8pm Albus Cavus will present an art workshop: Tag Your Name taught by Asad “ULTRA” Walker. All ages are welcome with a $5 per name suggested donation. Please wear work clothes. Albus Cavus will be presenting Abstract Mail Art taught by Franck De Las Mercedes (all ages, Suggested Donation $30, work clothes) from 12-2pm. From 6-8pm, check out Stenciling by Kevin “JAZI” Irvin (all ages, Suggested Donation $30). Join the Crystal City BID and Art Whino for a closing reception swimming in the vast glory of all that is 80's with DJ LIL'e on the turntables. There will be prizes for best 80's outfit, an Atari 2600 Tournament on a giant projection screen with prizes, a break dance competition, and a Michael Jackson Dance Off. Truth Among Liars will be in the house again to customize your clothing and accessories with their many silkscreen designs. Make sure to bring your items to be customized! Resident DJ Lil'e, aka Erin Myers, specializes in rare extended mixes and one-hit wonders whose names have been swallowed by time. Art historian and educator David Driskell, professor emeritus, University of Maryland, offers a talk on the internationally known artist and former Washingtonian Elizabeth Catlett and her contribution to Mexican art and aesthetic values followed by a visit to the exhibition Elizabeth Catlett in Mexico & Shouts from the Archive: Political Prints from the Taller de Gráfica Popular. A quest to visit the most remote place from any road in the lower 48 states is chronicled in this film. The film explores the concept of wildlife corridors, the potential for greening our highway system, and the fusion of high-tech engineering with the best and brightest environmental research happening today. A panel discussion facilitated by Christine Gerencher, Senior Program Officer for Aviation and Environment, Transportation Research Board, National Academy of Sciences will follow the screening. Participants will include Joe Burns, National Transportation Ecology Program Leader; Patricia White, Director, Habitat and Highways Campaign, Defenders of Wildlife; and Bill Branch, an ecologist with the Maryland Department of Transportation. Twelve leading architects and urban planners from around the world including Thomas Mayne of the United States, Kengo Kuma of Japan, Markku Komonen of Finland, Jaime Lerner of Brazil, Ivan Harbour of the United Kingdom, and Massimiliano Fuksas of Italy, share their vision on architecture that respects nature. Focusing on people who care about the future and who want to make a difference, the film is a reflection on the value society places on the built environment and how architecture influences society. Susan Piedmont-Palladino will follow the screening. Tell WPA your vision for WPA and they will grant you the greatest wish of all — delicious Belgian Waffles made from scratch by the membership intern Laura Fox! Your feedback on WPA programs will become part of the process of forming a strategic long-term plan for the organization. Kick back with your fellow artists and share ideas in a structured format, where there will be discussion on the future of WPA, current programs the state of the DC art scene and where you think WPA belongs in the bigger picture. Before the waffles start to flow, please consider some of the following topics in preparation for the discussion; space issues, the membership program, and WPA’s current marketing strategies – pros and cons. 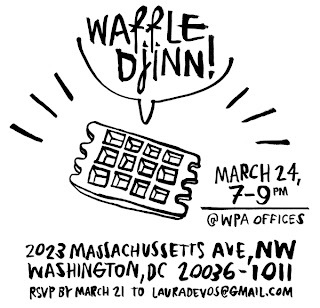 **WPA upped the ante on this waffle-centric event! They are announcing a raffle at the Djinn for one artist to win a $100 Gift Card from PLAZA Artist Materials. Join WPA for this special event and a chance to win! Crystal City BID President/CEO Angela Fox is a finalist for Arlington County's Women of Vision 2010 Awards. The award recognizes women for their accomplishments and contributions to improving the lives and opportunities for Arlington citizens, especially women. The award ceremony and reception is on Wednesday, March 31 at the National Rural Electric Cooperative Association, 4301 Wilson Boulevard. News anchor Maureen Bunyan will be the keynote speaker. Click here for more information. Congratulations Angie! WASHINGTON, DC – Bart O’Reilly’s Old Lines from the Luminous State explores the deterioration of our infrastructure, referencing places such as highways and farms, as well as the industrial tools utilized in their creation. Each piece of artwork is created with a nod to the corrosion of an object or place. Viewers confront the natural and man-made factors that facilitate the decline of the systems that make up our everyday experience. “It’s rare to find an Irish visual artist exhibiting in The States, and Bart is one of Ireland’s brightest young talents. We are excited to work with Flashpoint Gallery for Bart’s first exhibition in Washington, DC,” says Solas Nua Artistic Director Linda Murray. The exhibition features large-scale drawings, a video, photographs and an installation. O’Reilly invites viewers to interact with the exhibition through the installation: wood and sawdust will be scattered on the floor, creating a visual record of each person to visit the space and demonstrating the interaction between humans and nature over time. His collection of discarded metal objects from an ancestral barn in Hartford County, Maryland inspired the drawing process, wherein the artist utilized water-soaked paper to bleed out the rusty tools. The video explores the effects of a series of car crashes on a highway divider located on Baltimore’s Interstate 83. “My earlier work was painted in real-time; a video projected directly onto the canvas informed my creation. This process began my interest in time and the transient nature of actions. The work in my upcoming exhibition uses found objects – rusty tools and paper subjected to natural elements – to explore the nature of our common experience and how it is tied to the concept of time,” says O’Reilly. Bart O’Reilly graduated from the National College of Art and Design in Dublin in 2000. He participated in exhibitions in Ireland and Northern Ireland including Group Six at the Rubicon Gallery in Dublin in 2001 and Painted at the Sligo Art Gallery in 2003. O’Reilly is currently based at Baltimore’s Load of Fun Studios. O’Reilly’s work has been featured at Philadelphia’s A-X-D Gallery, Annapolis’ American Contemporary Gallery, and Baltimore’s Nudashank Gallery. O’Reilly directs an art program for adults with developmental disabilities in Anne Arundel County and is currently pursuing a Master of Fine Arts at Maryland Institute College of Art. Solas Nua is the only non-profit organization in the United States dedicated exclusively to contemporary Irish arts. Solas Nua is a resident organization at Flashpoint. April 10, 2 – 5 p.m. Ever make a fanvid or remix someone else’s music? Today’s technology makes new art forms easy—but are they legal? Is your use of someone else’s copyrighted work fair or infringing? Find out April 10 when Maryland Lawyers for the Arts (MLA) and the American Visionary Art Museum (AVAM) present a “Conference on Creativity & Law,” a look at the legal protections and hurdles artists of all kinds must navigate in their pursuit of life, liberty, and happiness. Baltimore attorney Scott Johnson will map the current contours of copyright law, Creative Commons expert Fred Benenson will lay out that organization’s DIY approach to copyright, and filmmaker Kembrew McLeod will screen and discuss “Copyright Criminals,” a history of hip-hop and sampling. Sponsored by the Baltimore City Bar Foundation. "Let me tell you early in this discussion: this is the best art show that I have ever seen at the Art League Gallery; ever. At the Art League exhibition, Rosemary has two distinct sets of artworks that once again move printmaking to a new place: one is a set of "peep boxes" and the second is a set of lighted wall installations." Gallery Neptune is pleased to present the third in its series of social/art evenings, LANGWIDGE. The evening event will feature our current exhibition of landscapes and seascapes by Washington, DC artist Freya Grand. Participants will be asked to wander through the exhibit while listening to original scores inspired by the paintings. They will carry clip boards to write any words (actual or fabricated) that come to them as they take in our micro musical and visual cultural experience. The words will be collected into one box. Charles Jensen, director of The Writer’s Center, along with poet Reb Livingston will kick off a dada poetry reading for the final hour of LANGWIDGE. Dada inspired poetry is created by randomly choosing words from prewritten slips of paper and through the order of that selection a poem is created. Participants will then have a chance to volunteer to read additional poems. "Don Kimes: Before and After the Flood." A lecture titled "Don Kimes: Before and After the Flood" to be followed by Q&A with artist and American University Professor, Don Kimes. This lecture will address the evolution of his work over several decades and his current exhibition at the Katzen Museum. There is no charge for this event, however, Washington Studio School asks that you make a donation at the door to support Washington Studio School (a non-profit, 501(c)(3), dedicated to promoting art in the DC community). In 2003, a flood destroyed his home, studio and much of his work. A year later he wrote about, "the loss of nearly all of the works on paper that I have ever done - 25 years worth - as well as videos and thousands of photos of my family and my art, most of the slides recording all of my work, five filing cabinets full of all of my writing and other papers, the computer and all of the back up disks, and many other elements of my life's work. It was like the record of my existence had essentially been erased. The house and furnishings seemed almost incidental. Nature took everything back. My work is now based on those destroyed images. Through them color form and structure combine with nature, time, memory, loss and rebirth. But that's what my work always sought. It's just more clear now." Kimes' work has been presented in more than 150 group and solo exhibitions internationally. Since 1986 Kimes has been Artistic Director in the Visual Arts at the Chautauqua Institution (VACI) in New York State. He has been a Professor of Art at American University in Washington, DC since 1988. Previously he was Program Director at the Studio School in New York City, where he also taught painting and drawing for 10 years. Lisa Tayerle, Marcos Bisticas-CoCoves, JL Darrah, Jennifer Herbert, Zia Hilditch, Laurel LaFey, Andrea McCluskey, Michael Sylvan Robinson. Faery is a world just a side step away from ours, a world so impossibly magical, but what cost that step: joy, power, fear, innocence, freedom. Guests join Gallery 10 member Lisa Tayerle in creating a magical inter-disciplinary exhibition. Faery, mystical beings, guardian and elemental spirits are the theme for this exhibition which will include: mixed media two and three dimensional work, ritual theater performance, music and dance. Lisa Tayerle Lisa is a member of Gallery 10, and host for this exhibition. She is a visionary artist and Wiccan priestess. She works in mixed media print and found object assemblage Creating pieces that speak to the sacredness of the earth. Marcos Bisticas-Cocoves Marcos is a practitioner of the Reclaiming and Feri traditions of Witchcraft. Drawing from his visionary experiences, he is re-creating the Tarot using Photoshop and collage. Andrea McCluskey Andrea is a painter, printmaker and sculptoR who lives and works in Frederick, Maryland. She is interested in the relationship between consciousness and the phenomenal world. Her imagery is drawn from experiences in wilderness and urban spaces. Jennifer Herbert Jennifer is an artist and dancer from Baltimore, MD. She is interested in the intersections between the material and imaginary realms, believing that both the physical and the fantastical are necessary for life. has been shown in galleries and exhibitions including the National Queer Arts Festival in San Francisco (2009). He is a semi-finalist for the 2010 Sondheim Prize, and his work will be exhibited in this year’s Artscape. Zia Hilditch Zia spent 6 years working in the production shops of the Shakespeare Theatre and freelancing himself as a theater artisan, whiteface fool, and variety artist. One fruit of that time as been feline Commedia del'Arte half-masks. JL Darrah After many years as a performer, costumer and mask maker, Darrah has recently been motivated by mosaic. Inspired by air and water, fire and earth her work expands into large and permanent tools for the celebration of those elements. Sally Bowring: A native New Yorker currently lives in Richmond, VA. Ms. Bowring teaches painting at Virginia Commonwealth University and was the recipient of the Virginia Museum of Fine Arts Professional Fellowship and the Theresa Pollak Visual Arts Awards 2003-2004. Sally Bowring is represented by Reynolds Gallery, in Richmond, VA; Her artwork has been exhibited extensively nationally and internationally. Only original works not previously shown at RMA and created in the last 2 years will be eligible. All media will be accepted. Artists residing in Virginia, Maryland, North Carolina and the District of Columbia age 18 and up are eligible for entry. Artists may submit a maximum of three (3) images of individual works. You may submit digital images only on a compact disc 300 dpi, jpeg format no larger than 1 mg.
Each file name must follow this precise format: It should include your last name, the image number (1–3) as it corresponds to the image description form on the application, and the title. No substitutions or extractions will be allowed once selected. - Legal sized envelope for notification of acceptance with name and return address. Works selected for exhibition must have a completed label affixed to the lower right hand corner on the back of the work. All works must be ready for installation. Two- dimensional work must not exceed 6’ vertical and 8’horizontal, including the frame. RMA reserves the right to exclude any work from the exhibition. RMA reserves the right to photograph and reproduce any work for publicity purposes. All fees are nonrefundable. Submit cash, check, or money order payable to RMA. Entry Fee includes a one-year membership to RMA. Completed applications must be received by 5pm on Friday, April 11th, 2010 no exceptions. Shipped work must be in reusable packing materials and accompanied by a check or money order covering return freight. Shipped work arriving without the proper return preparations will not be the responsibility of RMA. Insurance coverage for works in transit to and from RMA is the responsibility of the artist. Works not retrieved by July 21, 2010 becomes property of RMA. RMA will charge a 25% commission on the sales price of any works sold during the exhibition. Jurors will review all entries and make selections. Notification of acceptance will be mailed by May 6, 2010. Information regarding acceptance will not be available until that time. No telephone inquiries, please. Please complete application and mail with images, entry fee and self-addressed, stamped envelope to RMA. Make checks payable to RMA. Art historian Robert Rosenblum called Cubism “one of the major transformations in Western art.” The movement paralleled discoveries in philosophy and psychoanalysis, and it gave painting the same problematic status as the concrete poetry of Apollinaire and the atonal music of Schoenberg. The speaker will explore how Cubism, influenced by Cézanne and tribal art, developed from the tentative beginnings of landscapes painted in Provence to the intricate and mysterious portraits and still lifes of the High Analytic style. March 1, 2010 (Bethesda, MD) –The Bethesda Arts & Entertainment District is accepting submissions for The Trawick Prize: Bethesda Contemporary Art Awards. The 8th annual juried art competition awards $14,000 in prize monies to four selected artists. Deadline for submissions is Friday, April 9, 2010 and up to twelve artists will be invited to display their work during the month of September in downtown Bethesda. The first place winner will be awarded $10,000; second place will be honored with $2,000 and third place will be awarded $1,000. A “young” artist whose birth date is after April 9, 1980 may also be awarded $1,000. For questions regarding the Trawick Prize, please visit www.bethesda.org or call 301-215-6660. Do you want to experience art with a different sense. Go smell the art! You'll be delighted. A show exploring the olfactory system, or how smell impacts visual perception and memory. aromatic oil-based glycerin blocks embedded in a LED grid frame. For over 15 years, Curator Baysa has sub-specialized in the field of olfactory art and has gathered 9 of the nation's top conceptual scent artists here, transforming The Joan Hisaoka Healing Arts Gallery space into an olfactory art lab. Before they can rely on their eyes, visitors "see" the show through their noses and interact with the works via their senses. Artist, Peter Hopkins, describes this encounter as "shocking" the viewer to "see" beyond the visual domain. In addition to Peter Hopkins' perfume installation, Gayil Nalls has created an edible aromatic candy, which participants are encouraged to taste and experience in the space. As Nalls describes, "the interactive experience is sculptural," with layers of aromatic flavors revealing themselves as the candy artwork dissolves. Gallery Director Brooke Seidelmann welcomes you to come explore art through your nose and witness (smell) this remarkable show first-hand! Science tells us that messages received via smell receptors move instantly to the primal brain and trigger emotions and memories, and in this exhibition the artists manipulate smell to directly communicate with their viewer’s sensate body. Some artists, using aromatic oils and fragrances, transform the traditional gallery into an olfactory lab; others use visuals to invoke olfactory stimuli. Visitors will experience the connection between physical health and visual, gustatory, and olfactory. Elements of speed, motion, and force can be found in artist Kevin Mellema's work, a manifestation of his life-long love of speed, movement and balance. Application deadline: Friday, April 2, 2010. Applications must be received by 5:00pm at the Gateway CDC office, address below. Notification: By April 10, 2010 via email. Materials will be returned at the artist's or curator's request if SASE provided. Reception: To be arranged according to needs of the exhibition. The 39th Street Gallery is dedicated to fostering innovative, creative exhibitions and projects that engage artists, curators, critics and the public in a contemporary art dialogue. An artists advisory group reviews proposals at stated deadlines and on an ongoing basis. The gallery is 450 square feet and features high, open ceilings, a bank of windows along the southwest wall, track lighting, and pristine white walls. There is close access to the loading dock, just outside the gallery entrance. Gallery hours: At present, the Gateway CDC can staff three shifts weekly; Thursday and Friday evenings from 7-9pm, and Saturday afternoon from 12-4pm. The artist may open the gallery for additional hours, pending staff approval. The artist will receive up to $500 honorarium. Gateway CDC will take 25% commission on sales during or as a direct result of this exhibition. The Elson Lecture Series features distinguished contemporary artists whose work is represented in the Gallery's permanent collection. For the past 30 years, Susan Rothenberg has expanded the poetic and painterly possibilities of her craft. Her first solo exhibition met with great acclaim for its three large paintings of horses in stark silhouette. Coming at a time when minimal and conceptual art dominated the New York scene, these works anticipated and sparked trends in painting in the 1980s. Rothenberg's works celebrate the process of painting. In 1990 she moved to rural New Mexico with her husband, artist Bruce Nauman, and her work changed, reflecting her new environment; her paintings increasingly incorporated narrative and memory. Two important paintings by Rothenberg are in the National Gallery's collection: Butterfly (1976), currently on loan to the White House, and Head within Head (1978), on view in the East Building. Mia Feuer Artist Talk canceled for today! Please join Transformer this Saturday, March 20 at 2pm for a talk with Suspended Landscape artist Mia Feuer in conversation with Transformer's Executive & Artistic Director, Victoria Reis. Gateway Arts Center - Grand Opening and Open House Today! 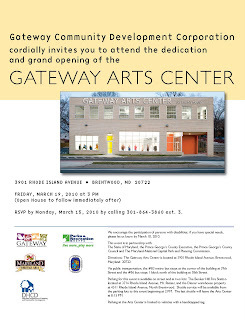 The Gateway Arts Center at Brentwood will have its Grand Opening today Friday, March 19! The dedication will begin at 3:00 PM. Following the official activities will be an Open House from about 5:00 to 8:00 PM with celebrations and refreshments throughout the building and art on display in all three galleries. The M-NCPPC Gallery on the first floor will have a group show curated by F. Lennox Campello with work by artists from the Gateway Arts District. The African American Museum will also have artworks on display in their first floor gallery. On the second floor the 39th Street Gallery will have a show curated by Claire Huschle of works by the resident artists of the Gateway Arts Center. The 39th Street Studios will also be open for visitors. Mayor's Award Finalists: "On March 22, Margery Goldberg will be honored as one of four finalists at the 25th Annual Mayor's Arts Awards in the category of Excellence in Service to the Arts, a prestigious honor conferred by the District of Columbia to individual artists, arts organizations and arts patrons. The ceremony is open to the public, at 6 PM at the Historical Society of Washington, DC at 801 K Street NW. Come early ... space is limited." This Saturday, March 20, Ms. Goldberg will be recognized as a "Ward 4 Women in the Arts Honoree" at the 3rd Annual Women's History Month Awards Ceremony, under the auspices of Councilwoman Muriel Bowser with special guest Michelle Fenty. At that time, she will receive the "Entrepreneurship in the Arts" Award. The event, from 4-6 PM is at the Washington Ethical Society, 7750 16th Street NW, 20012. If you would like to attend, please call 202-724-8025 or RSVP4muriel[at]gmail.com. A contribution of $51 is requested to benefit Bowser's Constituent Services Fund for Ward 4 families in need of emergency services. "Redding takes issue with Gopnik review"
Come on Baltimore, Let’s Suz-ercise! G40: The Summit / Grand Opening tonight!